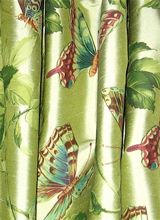 Anyone can buy and sell fabrics on-line. Many of the fabrics being sold on the internet are seconds or low-end goods, even though they are often (mis)represented as first quality higher end brands. As interior decorators and consultants, we have a professional obligation and personal commitment to honesty and fair pricing. 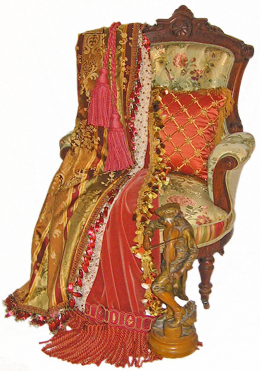 We work with our own established international network of resources and personally select each fabric we sell. We do not buy in lots and we do not buy (or sell) seconds or knock-offs. We offer only new (or new vintage) first quality upholstery and drapery fabrics and trims from the world's most exclusive design houses. Perhaps even more importantly, we are not typical retailers or e-tailers. 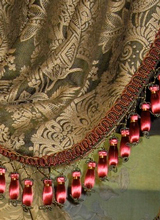 Our 20 years as decorators and our experience as long-time old-house owner/caretakers is reflected in our collection and in our guiding principle: to offer others who share our passion for fine fabrics and appreciation of value access to a wide selection of the finest drapery and upholstery fabrics and trims available. 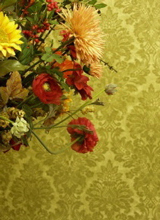 for Historic Reproduction Wallpapers, Borders, Antiques, Household Items, Collectibles, and Serendipitous Finds to Inspire, Accent, or Complete Your Decor.